Hei, tervetuloa Craft-Room haasteen pariin! Melkoinen kaksiviikkoinen emännöinti, huh, kun on vaikeaa taas valita noista upeista töistä ne kolme mieluisinta. Kiitos osallistumisesta. Mutta uuteen haasteeseen: "Olisitpa täällä!" DT Hazel haastaa postikortin tekoon, koko on määrätty 6" x 4", pysty tai vaaka. Minä tein parit Pariisi kortit. -Hi! Welcome, at Craft-Room Challenge! "My theme is Wish You Were Here. I'd like you to make a postcard from a holiday destination, it can be from anywhere in the world or perhaps you've been visiting the beach or a historical place. The size of the postcard has to be 6 inches by 4 inches landscape or portrait." Our sponsor is Crafty Individuals. Here's my DT samples, two Paris postcards. Backgrounds are sprayed with Dylusions (Funky Fuchsia, After Midnight; Cherry Pie)). I used masks and water too. Many different stamps: right corner text stamp is Crafty Individuals' (CI-017); Eiffel is Third coast RS; Paris- text is Tanda stamps; and the rest are Ecogreen crafts (Butterfly Post). Versafine inks: onyx black and imperial purple; clear embossing powder. 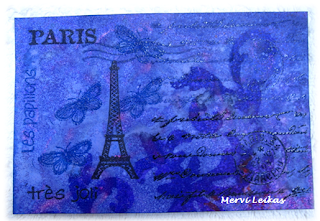 Both cards are beautiful Mervi, I love the images and those gorgeous colours. Stunning colours Mervi and I do know you loved being in Paris. Wautsi, mitkä värit, ihanat! Hauskaa vappua! 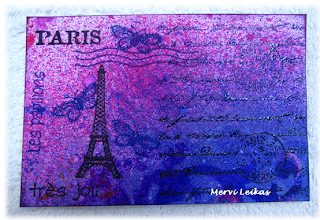 I love purple and this is such a gorgeous Postcard Mervi.I have never thought to make my own. What a great idea. Fantastic creations Mervi. I adore the colours and the Parisian layout. I spotted you over on MIM and came for a closer look and I am so glad that I did. That's a GREAT card! I love it! TFS with us @ PND! 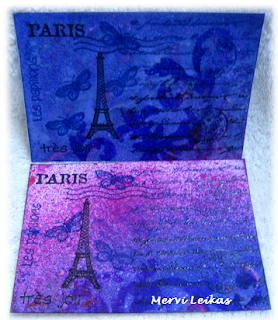 Love your inky backgrounds, as i see YOU always love Paris! 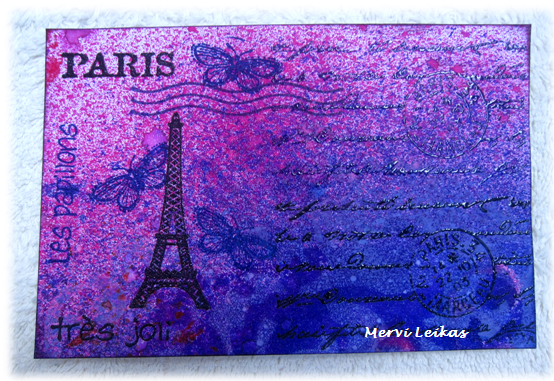 These are absolutely gorgeous Mervi, I love the strong colours, and how you've combined the stamps. Beautiful designs Mervi - love the gorgeous rich colours on both. Thank you for sharing with us at Challenges 4 Everybody and good luck! It's so cute! I saw you on Make It Monday. WOnderfull Mervi! Love the purple/blue colors! It's perfect! Thanks you so much for sharing with us over at Make it Monday :D! What gorgeous and bright color on your Paris postcards! I love the speckles the mists make! Thank you for traveling with us this week here at Simon Says Stamp & Show! These postcards are lovely. The background colours are so pigment-rich. 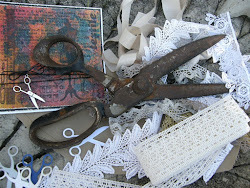 Great combination of stamps for the collaged look. Thanks for joining our Well Read Challenge at Craft Your Passion. I hope we see you again soon. And the clock is ...60! Craft-Room Challenge # 49 "So Sentimental"